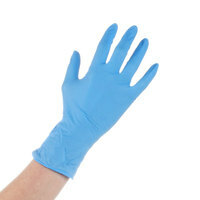 Whether your business deals with patients or with cleaning chemicals, nitrile gloves will protect the skin from harmful pathogens and chemicals, keeping your work environment safe. We also carry low dermatitis gloves to cater to your employees or patients with sensitive skin. When you need to eliminate the risk of contamination, try our disposable nitrile gloves. Also make sure to check out other great items from Lavex Industrial and Noble Products. Protect yourself and your employees with our nitrile gloves that are designed to resist cuts, punctures, and tears. These gloves also extend past the wrist, protecting more than just the hand for maximum safety. We offer several different colors so that you can color coordinate your gloves to avoid cross-contamination in your establishment. From taking out the trash to patient check-ups, these disposable nitrile gloves are essential for safety in your business. For other safety products, check out our disposable glove racks, biohazard bags, and medical faucets. If you're wondering where to buy disposable nitrile gloves, we have a large selection of disposable nitrile gloves for sale at the lowest prices.